Waid has created a one of the cruelest villains in comics. Categorizing “Irredeemable” as a story that wonders what would happen if Superman were to go bad would be superficially accurate, but series writer Mark Waid has imparted more gravity to the characters and world of “Irredeemable” that such a simple description would not satisfactorily acknowledge the power contained in the first volume of Waid’s chilling tale. While the characters who make up the cast of “Irredeemable” all have superhuman powers and wear flashy costumes, Waid gives them a real world sensibility that immediately distinguishes the material from what might have come off as a long form “What If?” or “Elseworlds” story. The same can be said for the citizens who reside in the world of “Irredeemable”, who all react to the events in the story in a way that you might expect real folks to react. 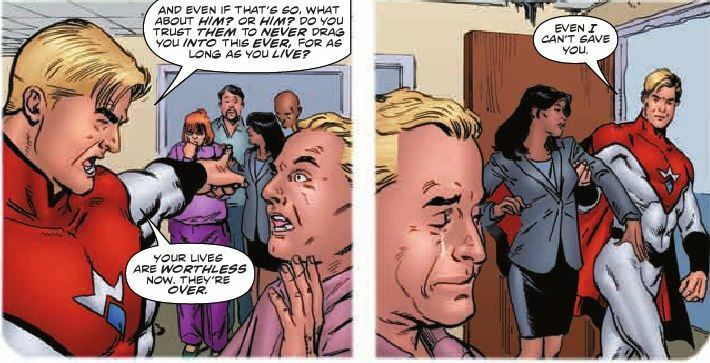 And the world of “Irredeemable” is nightmarish. Each chapter of Waid’s story features some sequence that involves unthinkable acts brought on by the Plutonian, the former protector of planet Earth and its strongest being. Waid imagines how someone with all of Superman’s powers might use them to bring about destruction, both small and catastrophic. Whether he’s reducing a family to ash or sinking an entire continent, Plutonian’s will to destroy has grown as great as his strength. Each chapter of “Irredeemable” involves a flashback which exposes seemingly innocuous moments where a small hint reveals that the Plutonian wasn’t going to be able to hold it together forever. The hero is a beacon of truth, justice and all that stuff, an inspiration to the world, but from time to time, events occur which illustrate that the hero’s head might not be on straight. One of the best involves the Plutonian saving the crowd at a baseball game from a marauding robot. While everyone is cheering the hero on, the Plutonian focuses his super-hearing on a single person who appears underwhelmed with the action. “Showoff jerk,” says the bystander. “Just a flippin’ underwear pervert.” Artist Peter Krause perfectly captures the troubled expression on the Plutonian’s face. Even with a stadium cheering him on, he just can’t help that this one critical voice has gotten to him. “Irredeemable” is both a character study of the Plutonian and a race against time as his former allies travel across the planet, desperately trying to find a way to bring their former teammate down. Admittedly, it’s those fiendishly vile scenes of horror that will resonate with readers. Waid writes scenes of such monumental cruelty, that it’s near impossible not be entertained by the magnitude of Plutonian’s villainy. Krause ensures that the camera never shies away from the horror of the villain’s sadistic acts. The Plutonian lays it out straight to his former friends. Perhaps the strongest chapter, the one that illustrates just how much this world is against the Plutonian, is the fourth. We learn that Plutonian led a double-life as mild-mannered Dan Hartigan and that he was in love with Alana Patel, a sound engineer from the radio station where he worked. Again, the strength of Waid’s material is that his human characters feel pulled right from real life, a little less spectacular than the interesting characters who make up the supporting casts of your favorite comic books. When Dan reveals himself to the woman he loves, the reaction is unexpected but totally believable. The Plutonian, without reverting to violence, exposes his fractured self and the results are ultimately devastating. Krause is perfectly suited for “Irredeemable” as it requires him to draw scenes of unimaginable terror. More importantly, the artist is required to remind us that the Plutonian was once one of the good guys. In the flashbacks we see the muscled blond hero soaring into action, his boyish hair and blue eyes make him look as menacing as a beagle. Watching him save a puppy in one scene, only to sink a continent a few pages later, never fails to be startling. Colorist Andrew Dalhouse presents the happier past in bright, lighter tones, while the present is often featured with a bleak and dreary pallet. Readers should be prepared for a lack of resolution by the end of this first volume as nothing appears to be wrapping up in this long form adventure. Plutonian remains on the loose and the small band of heroes are still at a loss as how to bring him to his knees. But don’t be dissuaded by this. Though “Irredeemable” takes 10 volumes to complete its story, that doesn’t make this first volume any less satisfying. On the surface, one might expect “Irredeemable” to be a one-note idea. But Waid is well aware that an evil-Superman story would grow stale before long. 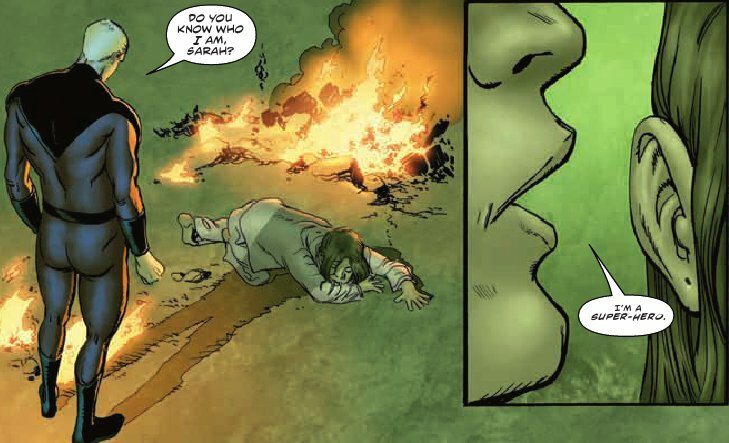 “Irredeemable” is an engrossing race against time, an ever-expanding mystery, and a glimpse into a nightmare world where everything has gone to hell. And boy oh boy, is it fun.